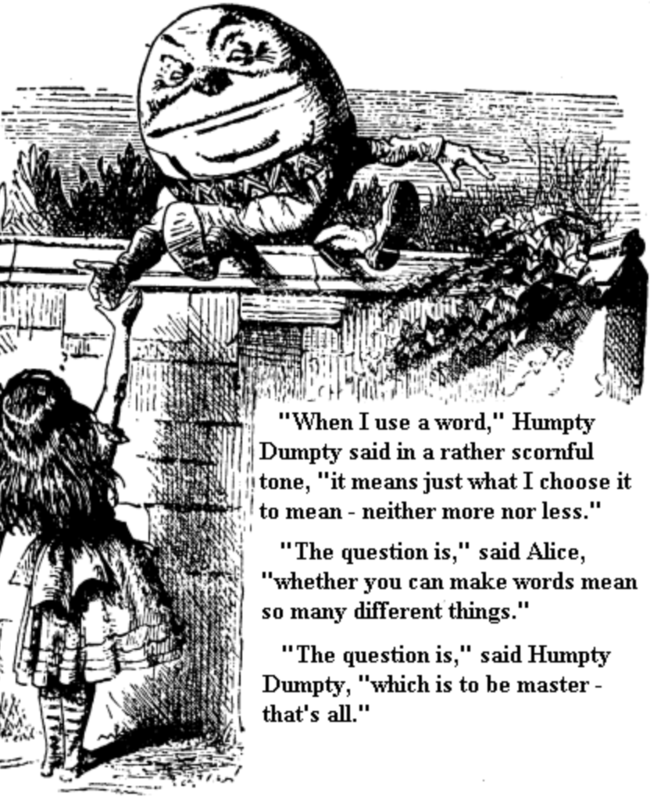 I wrote in a post back in March about the concept of “Humpty Dumpty words,” a reference to Lewis Carroll’s Through the Looking Glass, where Humpty Dumpty engages Alice (of Wonderland fame) in a “war of words” in which he gets to define the meanings. This is what I see in the voluminous writing happening as we speak on the “new Socialists” running in the upcoming elections. In this post, I add to that volume. We reached “peak irony” in the popular abuse of the terms capitalism and socialism, in my view, when we saw people in recent rallies carrying signs telling political leaders to “Keep your government hands off my Medicare.” More recently, we see the “capitalist” Republicans engaging in a trade and tariff war requiring $12 billion worth of additional farm subsidies to only partially protect a politically-valuable block of injured constituents. Adam Smith’s “invisible hand” and David Ricardo’s “free trade” be damned. And are Bernie Sanders and upstart congressional candidate Alexandria Ocasio-Cortez really “socialists” themselves, even if they self-describe using that word, so toxic to many Americans? Even though the political right is quick to throw in a “Marxism” (or more ignorantly, “communism”) charge, Sanders and Ocasio-Cortez are really proposing some pretty tame stuff in comparison to the long-standing practices of the more successful social democracies in Europe. I have yet to hear from them a proposal for governmental takeover of the assets of the industrial sector, so we are still pretty far from some “classical” socialist concepts. The word “socialist” now means whatever either side wants it to mean. Into that mix, let me rip down the complex and messy “Humpty Dumpty” definitions and suggest a simpler way to look at this. Since time immemorial, since what I call the rise of the “first ethical dilemma” faced by our hunter-gatherer forebears, humans have had to choose whether their best path to survival would be to “go it alone,” using just personal and family resources to tackle the challenges facing them, or instead opt for an emerging “community” approach, where they would have to extend trust to non-family while at the same time try to find ways to regulate any abusers of that trust. Sometimes throughout history one approach would work better, and at other times either of these approaches led to societal collapse. Since that very ancient day, human societies have tried “every which way” to resolve that paradox. Unavoidably, the “political power” question has historically tangled with the “economic distribution” question. Autocratic attempts to enforce economies labelled either “capitalist” or “socialist” have likely exceeded examples of good democratic governance in history, and we are approaching another one in the United States. I would suggest that most people have a hard time separating their economic biases from their political ones, which is why the terms “socialism” and “communism” are so often used interchangeably in the United States. The United States, which had “other things” on its mind when Karl Marx published his Communist Manifesto in 1848, has never (at least to this point) really had to deal with the “political power” question in the way Europe has, and so most Americans have little experience or frame of reference in differentiating “democratic socialism” from the dreaded “communism.” Especially in the minds of many conservative Americans, they are one and the same. At the same time, Adam Smith’s “invisible hand” of the market has also failed in critical times. In an earlier post about “free trade,” I noted how Adam Smith’s frequent assertion that “the carrying trade” (now called “global logistics”) served as a natural “brake” on international trade due to the (then) considerable costs of transportation of goods to and from distant sources. The efficiencies of the container ship have pretty well destroyed that differentiating factor in many global markets, bringing in a global “race to the bottom” for unskilled labor wages (predicted by Marx) that continues to harm American wages. Public education. The tradition of free public schools funded by taxation goes back to colonial New England in the U.S. In addition, the Morrill Acts of 1862 and 1890 instituted “land grant” colleges in many states, which include such premier universities as Michigan State University, Iowa State University and the University of California. A few months ago I wrote about how the late Michigan Republican governor George Romney (Mitt’s father and Ronna’s grandfather) instituted a very low-cost model of higher education in the 1960s (and nearly free in my personal case). So, Bernie Sanders is really not that far off Romney’s goal here. The radical Republican effort to de-fund public education is a relatively-recent phenomenon, and more evidence of ideological extremism than of common sense. The more controversial parts of “socialist” proposals of Bernie Sanders and Ocasio-Cortez will need to wait for Part Two of this series. My primary point of this first part is that the “capitalist/socialist” debate is filled with bogus grandstanding, ideological extremism, and a poor sense of history. There never was a time when the United States was a pure “capitalist” society, and so there is no “ideal” here to go back to even if we wanted to. Part Two of this series is now posted. Carroll, Lewis. “Chapter 6 – Humpty Dumpty.” Through the Looking Glass, Alice-in-Wonderland.net. Again we are victims of bad congressional actions here. The original purpose of the RFS was to get ever-improving technology rolling on renewable fuels, but it got “stuck” on the “easy solution” of corn-based ethanol. Programs to more efficiently generate ethanol from less valuable agricultural detritus have been stalled way before their technological viability has been proven or disproved. The “tragedy of the commons” refers to the harm done when shared resources (like air and water) are misused by the few to the detriment of the many.